Spider veins and heavy legs? No match for Veno SL® 300! For many people, the problem is part of everyday life – in the evenings in particular, you battle tired and swollen legs that don’t just feel heavy, but can also be painful. Aesthetically unappealing spider veins also occur and can be a particular problem for sufferers in “short skirt season”. The causes of this venous disorder are well-known, but are generally hard to avoid: standing or sitting for a long time, whether it’s in your everyday working life or on long journeys on planes or in cars, impeding the activity of the calf muscles and resulting in water retention in the tissue. High temperatures can further exacerbate the symptoms in summer. With Veno SL® 300, you can make things easier for your veins. 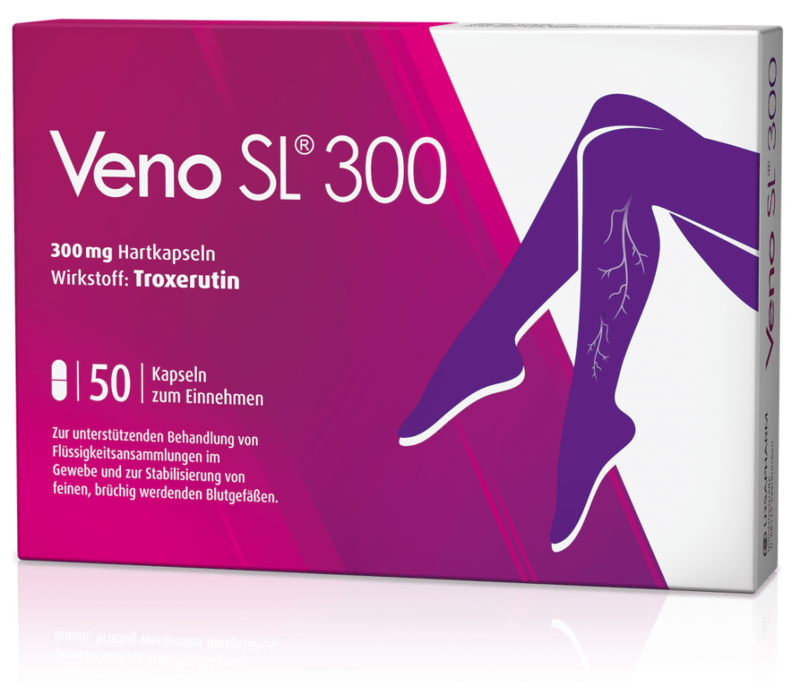 Thanks to the active substance it contains, troxerutin, Veno SL® 300 prevents the accumulation of fluid in the tissues, improves circulation and protects your legs against the development of spider veins. The activity of the muscles in the calves is very important for our blood circulation. They work like a pump to push the blood that is low in oxygen back to the heart against gravity. Standing or sitting for a long time impedes this activity of the calf muscles and the pump function gets bogged down. This means that the blood stays in the legs longer and the pressure in the veins increases. Under the static load, fluid seeps into the surrounding tissue. This causes heavy, tired and in some cases painful legs. Small blue bifurcations known as spider veins also often appear under the surface of the skin. The active substance in Veno SL® 300, troxerutin, is obtained from an ingredient in the Japanese pagoda tree. This substance encourages the “sealing” of the vessels. The active substance, troxerutin, helps to drain the tissue and improves circulation. Tolerability of Veno SL® 300 is so good that the medication can even be used during pregnancy (2nd/3rd trimester). 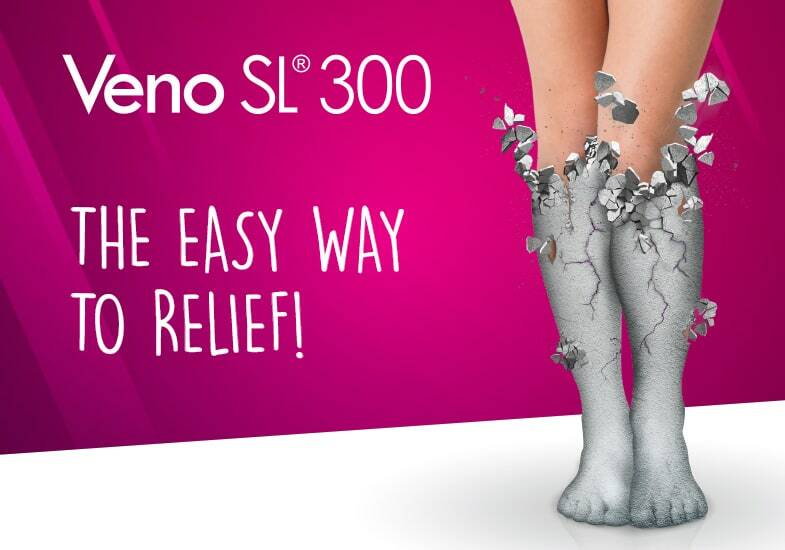 Flyer Veno SL® 300 – The easy way to relief! Active substance: Troxerutin. Therapeutic indications: Counteracting the formation of oedemas (oedema-protective agent), improving blood flow, providing supportive treatment of the accumulation of fluid in the tissue (exudative processes) and stabilising blood vessels that have become fine and fragile (capillary fragility). For risks and side effects, read the package leaflet and ask your doctor or pharmacist.